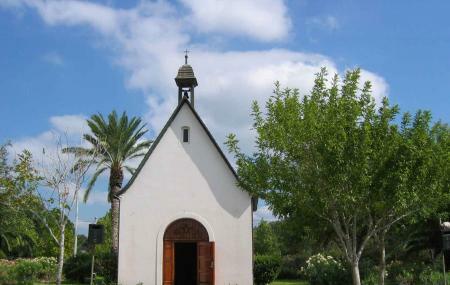 The Schoenstatt Shrine is a European style church situated in Cabo Rojo. At first glance, you wouldn’t be mistaken in thinking that you’re in a German town instead of Puerto Rico. However, it is actually a replica of the original Church of the Apostolic Movement of Schoenstatt in Germany. It was built and maintained by the movement of the Schoenstatt Sisters of Mary, and is one of only three such churches in all of Puerto Rico. The word "Schoenstatt" comes from the German word for "beautiful" (schon) and "place" (statt), and the pristine natural surroundings lend credibility to the name. The grounds are free for all, and you can walk through and explore the greenery around the church for as long as you like. The church in itself is quite small, with four rows of seats on either side. However, the wooden altar is exquisitely carved, with stained glass windows that are equally gorgeous. The church is open and airy, and the fact that it is situated on the top of a hill adds to its charm. There is a lovely fountain behind the church, accompanied by gardens. It is a great place to take a peaceful stroll. There is also a small museum and gift shop on the grounds. Who would have known, that you would encounter a piece of Europe when you were visiting Puerto Rico? Well, the Schoenstatt Shrine is just that- a surprising but pristine monument in the town of Cabo Rojo. There is no charge to walk around the grounds, but there are donation boxes in the church and in the museum. Donations are appreciated. Mass is celebrated on Thursdays at 7:00 pm and Sundays at 12:00 noon. They also have adoration and the Rosary a few times per week — call for the schedule. Everything will be in Spanish. How popular is Schoenstatt Shrine? People normally club together La Luna Lyn Restaurant and El Bohio while planning their visit to Schoenstatt Shrine.